Photo retouching with Lightroom dark presets gives a photo a special atmosphere and saturated colors. If you want to transform photo colors and tones into professional High End one, this plugin is made for you. For this purpose dark urban presets Lightroom have been created. 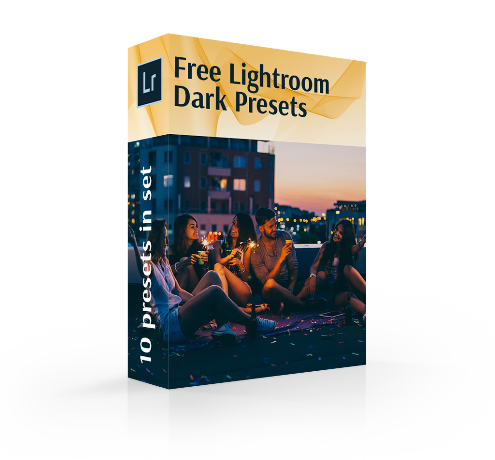 Our team has compiled a set of dark Lightroom presets for free that will make your photos amazing and interesting. Such Lightroom presets for dark indoor photos will give them mystics and emphasize their atmosphere. Lifestyle and adventure photography can be easily enhanced with dark presets Lightroom. They suit ideally for event photos with dark coloring, as they add realistic natural tones. After application of free Lightroom presets dark photos become deep in colors and magnetic to viewers. Such current free Lightroom presets for dark photos are completely great in adding atmosphere without spoiling initial colors. Described plugins have been designed for portraits with natural light. Modern photographers also use Lightroom dark presets for landscape and modern fashion photos. LR Preset #6 "Black and White"
Our free moody presets for Lightroom have a number of lines that are to be totally taken into account.Dark Lightroom presets for free are chosen when there is a need to intensify photo drama. That is possible by adding to photo shadowing, saturating colors and darkening highlights. By using these moody Lightroom presets photographers have possibility to underexpose ordinary pictures being sure that every detail will be emphasized on a final image. Like other top Lightroom presets achieved result depends totally on the characteristic of an unretouched picture. In any case dark presets Lightroom are the right choice for professional photographers. Such plugins open possibilities for experimenting with sliders and settings. Dark Lightroom Preset #1 "Warm"
A little dark and purple split is added to photos in case of choosing these free Lightroom presets dark. They also improve pictures by simple light, making the central part of a picture the focus of attention. Photographers play with sliders to achieve the desirable level of vibrancy and saturation depending on the purpose. Dark Preset Lightroom	#2 "Vibrance"
The next dark Lightroom presets for free deal with photo contrast. The main idea is that after such plugins the pictures acquire highly saturated tones and deep visible contrast. At the same time skin tones remain natural, as if not retouched. The most visible effect is viewed on black and white colors, as they become brighter than usually after such contrast Lightroom presets. Dark Lightroom Preset Free #3 "Matte"
These dark presets Lightroom suit for efficient enhancing evening and especially night photography. They contain lots of creative retouching options that are focused on highlighting every shadow and color. In the end photographers get mysterious, unusual and expressive pictures. That is possible due to bringing rich moody coating that works efficient with dark images. Free Dark Lightroom Preset #4 "Sepia"
Such free Lightroom presets for dark photos are among leaders of photographers` choice. They highlight tones and make photos deep and moody. The algorithm of enhancing is simple. Free sepia presets lower the photo exposure and increase the warmth. Photographers experiment with setting to choose the best level of increasing. Lightroom Preset for Dark Photos #5 "Moody"
That is one more plugin that turns photography into attractive colorful photo samples. These Lightroom dark presets differ from other plugins, because they make the whole picture sharper and stronger. For this ability photographers currently choose them for landscape and lifestyle pictures, as they underline important details and motions. Lightroom Preset Dark #6 "Black and White"
The biggest bonus of the next Lightroom dark presets is that they can be applied to any type of photos without danger of spoiling them. After such plugins photos are still able to preserve the captured atmosphere. That is possible by highlighting all details and making shadows more visible. Adobe Lr Preset for Dark Photos #7 "Pastel"
A magnetic desaturated photo sample is a goal that is achieved by using these Lightroom presets for dark indoor photos. They make picture brighter and saturated. For these techniques, plugins of this kind suit ideally for the sullen landscape photography. Picture of this type have a big proportion of black parts and shadows. They also have lots of mist and clouds and dark presets Lightroom cope quickly and professionally with enhancing these parts. Having accessed the beneficial power of such plugins, the photographers also apply them to street and lifestyle pictures. Lightroom Dark Preset #8 "Cool"
The working strategy of the next dark urban presets Lightroom is concentrated on getting professional cinematic photo look. They are also used to achieve a vintage effect that is possible by adding warm tons and little fading. After such options photos do not lose in coloring like many old pictures. They preserve their charm and attractiveness. Dark Lr Preset for Free #9 "Stylish"
Free Lightroom presets for dark photos are suitable for all photo styles and types that are connected with international fashion industry. Their plus is that they remain pictures clear and with high contrast. For this they are appreciated by professional retouchers and demanding photographers and stay popular. Free Lightroom Preset Dark #10 "Vintage"
The last dark Lightroom presets for free have a wide sphere of application. The photographers frequently choose them to improve travel, lifestyle and landscape photography. According to new tendency such plugins are used with food photos. They add dreamy and bright photo tones. After enhancing with these dark presets Lightroom photos get increasing of warm tones that add a sense of magic. Some plugins from this collection are able to emphasize cool and pale picture tones. To darken any image with dark urban presets Lightroom, you need firstly to reduce its brightness, but at the same time, you need to monitor the contrast, in order to have confidence that you will not to spoil the final result of the retouching work. On this principle, all our free Lightroom presets for dark photos are built. After choosing these Lightroom presets for dark indoor photos you will be able to notice successful results. You will note how the brightness has been decreased, the contrast has increased, the color tones and the saturation have changed. You should select free Lightroom presets dark depending on the type of photo you are retouching. Each high contrast Lightroom preset will add a mixture between dark and light colors and give the improved image a mystery that will be memorized for a long time. Our professional retouchers devoted much time to the successful creation of all presented Lightroom presets for dark indoor photos. This fact makes contemporary photographers believe in their beneficial power and ability to enhance photography without much efforts and wasted time. High flexibility concerning combinable photo styles has made dark urban presets Lightroom be downloaded very often.